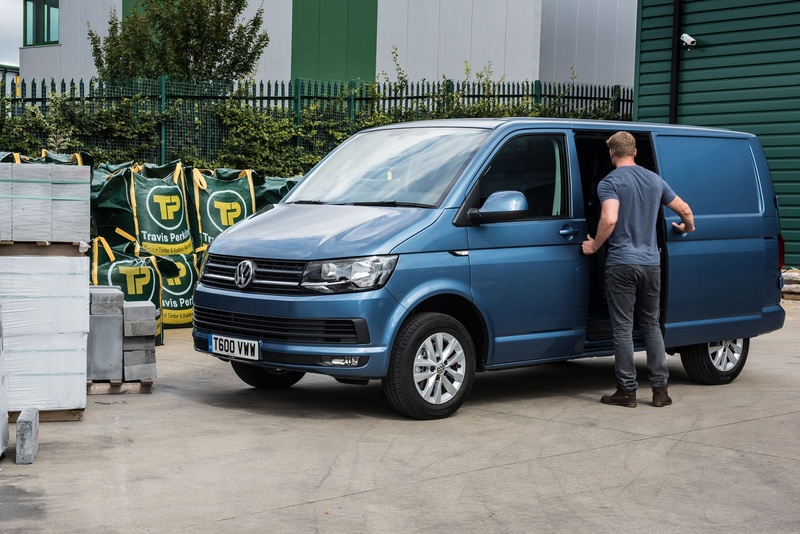 Volkswagen's Transporter T6 panel van continues to be a quality and cost-effective offering in the medium range LCV sector thanks to a wide range of common-rail diesel engines and a tangible boost to its safety specification. 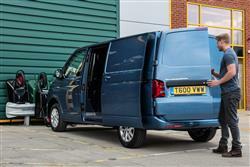 The interior remains one of the most polished in the panel van class and the wide range of body options should keep most operators happy. This is the sixth generation T6 version of Volkswagen's Transporter, a medium-sized panel van that sits in the Wolfsburg maker's van range above the compact Caddy but below the substantial Crafter. Throughout all its incarnations, this vehicle has managed to remain simple, effective and well suited to the needs of its operators. There's quite a bit of competition around for the Transporter from models including the Citroen Dispatch, the Vauxhall Vivaro, the Ford Transit Custom, the Mercedes Vito and the Renault Trafic but Volkswagen will be hoping that a vast model range, some clever engine technology and a detailed specification will carry the latest version to glory. 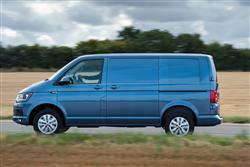 The Transporter engine range consists of four 2.0-litre TDI Euro6 engines with outputs of 84PS, 102PS, 150PS and 204PS. All 84PS and 102PS engines are fitted with a five-speed manual gearbox as standard, with 150PS and 204PS units equipped with either a six-speed transmission as standard or a seven-speed DSG automatic. So far so good, but what's it actually like to drive? Well 'quietly efficient' probably sums it up. 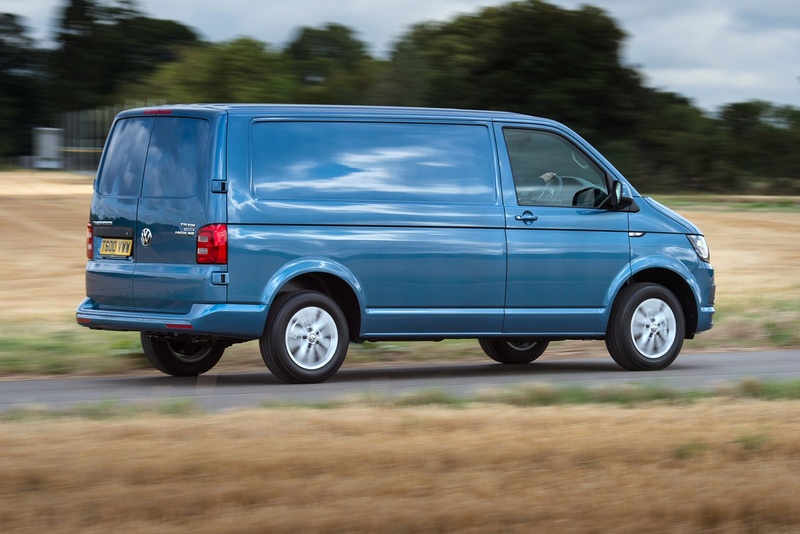 The 'quiet' bit's significant: Volkswagen reckons that drivers used to rival vans will find this one to be much quieter, which'll make a lot of difference after a hard day at the wheel. And efficient? Well, let me put forward the braking system as an example. It features ABS of course, with Electronic Brakeforce Distribution and Electronic Braking Control to maximise its effectiveness and as soon as you use it in anger, the brake lights flash rapidly to alert following vehicles. Once you've screeched to a stop, the hazard warning lights come on automatically. Neat. 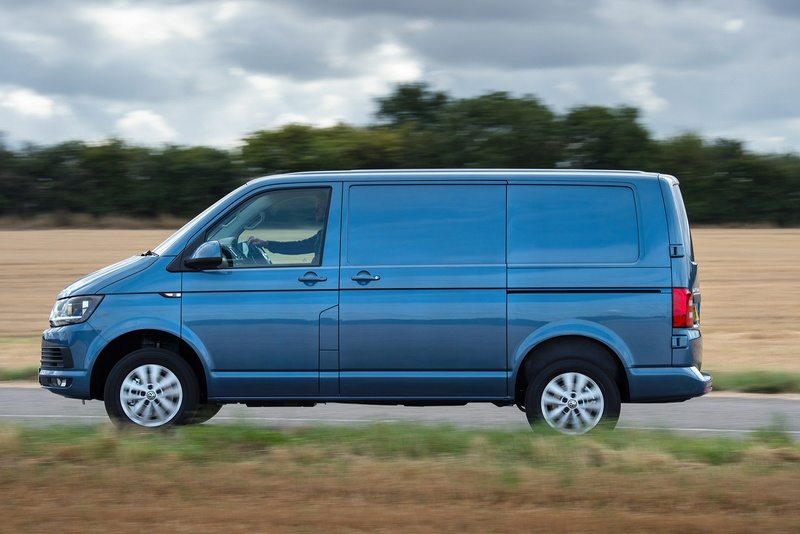 The Transporter's traditionally precise handling remains, with plenty of feedback through the redesigned steering, a slick gearchange and a Germanically firm but by no means unpleasant ride. It's manoeuvrable too, for such a big vehicle. The current Transporter looks a sharper proposition than its T5 predecessor - but not by much. In keeping with tradition, this T6 model offers a range of body options and gross vehicle weights to suit the needs of all operators and drivers. In addition to three roof height options; standard (1,410 mm), medium (1,635mm) and high (1,940mm), this Volkswagen is available with four gross vehicle weights (ranging from 2,600kg to 3,200kg) along with short and long wheelbase options. At the wheel, there are the expected driver and passenger airbags, plus a height and reach-adjustable steering wheel. Sliding across the three-seater cabin is slightly impeded by the way that the gear lever is mounted on a moulding that curves out from the dashboard, but the location does make it easy to use. A design touch we weren't sure about was the way the more aerodynamic outside mirrors house the radio, 'phone and GPS antennae: bashing them, as van drivers tend to do, would be expensive. Still, there are plenty of more thoughtful design features dotted around the cab. Each door, for example, incorporates both upper and lower storage bins, the lower one able to accommodate both a 1.5-litre bottle and an A4 clipboard. On the passenger side, there's a storage box under the seat and, on the side of the facia, a net to hold documents. Pull out the ashtray and you'll find cupholders for your McDonalds breakfast on both sides and there's a shelf for your sunglasses above the windscreen. As usual, there's a choice of Panel Van or 'Kombi' Crew van variants. Entry-level 'Startline' Panel Van models are priced from around £19,000 (panel van, excluding VAT) and include a host of standard features including BlueMotion Technology, a DAB+ digital radio, a 5-inch touchscreen, Bluetooth phone connectivity and a USB connection. Standard equipment also includes Volkswagen's acclaimed Automatic Post Collision Braking system, which automatically applies the brakes after a collision, reducing the risk of a secondary impact. 'Trendline' models get smarter wheel trims, a full-height steel bulkhead (panel van), body-coloured bumpers and rear parking sensors. A Comfort pack consisting of foldable grab handles on A-pillars, additional storage compartments, dimmable cabin lights and additional noise suppression is also fitted as standard. 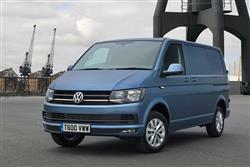 'Highline' models top the Transporter range. Here, buyers get a leather multifunction steering wheel, a heated windscreen, an automatic driving light control, daytime running lights and 16-inch Clayton alloy wheels. 'Highline' models also come with front fog lights with cornering function and a Thatcham Category 1-approved alarm as standard. If you�re looking for a new Volkswagen Transporter T32 Lwb Diesel 2.0 TDI BMT 150 High Roof Startline Van for sale, you�ve come to the right place. 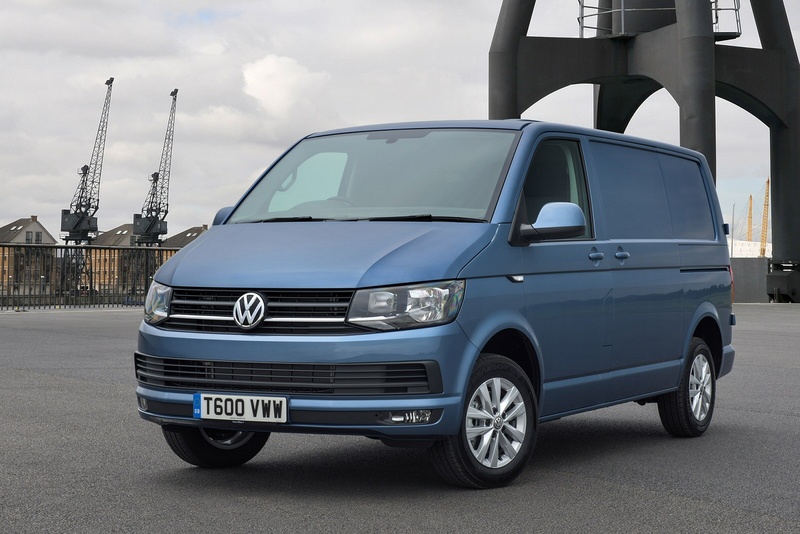 At Bristol Street Motors we don�t just have the best Volkswagen Transporter T32 Lwb Diesel 2.0 TDI BMT 150 High Roof Startline Van deals, we also offer friendly advice and help with all your enquiries to ensure your buying experience is a happy experience.